Xavier is a chord learning machine. 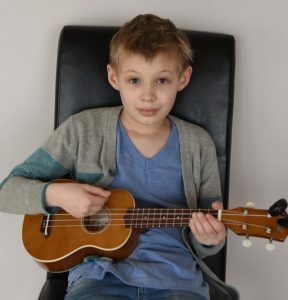 In less than a year of lessons, I think he’s learned more chords than any of my other ukulele students. We had to move beyond my recommended common chords and into an ukulele chord dictionary for more material. He’s on the cusp of nailing his first barre chord, which will open up more harmonic worlds to explore. He was also my first student to exhaust my knowledge of Star Wars music. We covered the main theme, the “Imperial March”, Luke’s theme, Leia’s theme, and Yoda’s theme. Time to dive into the prequels! Xavier loves to rock out with his family singing Weezer’s “Say It Ain’t So”. His latest project is applying a couple new strumming patterns to Fall Out Boy’s “Centuries”.